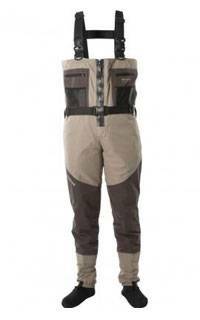 View our great value breathable chest waders. We have zip front, stockingfoot and bootfooted waders from many leading manufacturers, many at discounted and bargain prices or available as special offers with wading boots and other accessories. 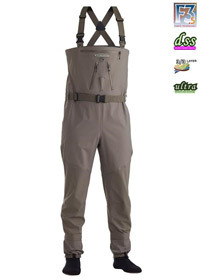 The Women's Ultralight Convertible Wader is a remarkably versatile, innovative wader designed in a lightweight package without sacrificing durability and performance. Incredibly comfortable modern women's fit offers superior performance without the traditional weight and bulk. For the more demanding angler, Climatex4L fabric technology in the upper brings maximum breathability, and therefore comfort, whilst Climatex5L in the lower leg region means you can confidently attack the bank without fear of damaging your waders.  The outer chest pocket doubles as storage and a convenient hand warmer.  Climatex4L highly breathable and durable upper.  Climatex5L heavier, puncture and abrasion resistant lower leg.  External double chest pocket. Velcro fastening stash pocket for handy storage and fleece lined hand warmer pocket.  Anatomically shaped leg for improved manoeuvrability. 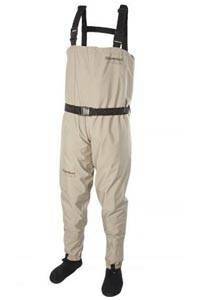 Affordable great looking waders with high-end waders functionalities. Extremely comfortable due to their lightweight construction and material selection. Large front pocket provides plenty of space for accessories. Incorporates all the normal goodies such as matching color belt and braces, built-in gravel guards, drying loops etc.  Lightweight 4 layer construction throughout.  Waterproof and breathable F3 fabric.  A large pocket with three sections laminated inside with a water resistant YKK Aquaguard zipper in front.  Matching color belt and braces with olive green details.  D-rigs & accessory loops.  Traditional flip pocket with a zipper.  Neoprene feet with left and right side design. 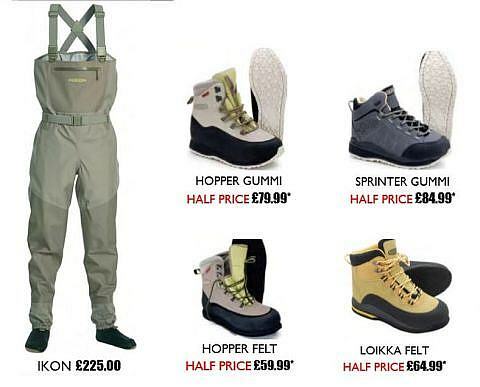 Buy the Hopper Stockingfoot Waders and get the Vision Hopper Felt, Hopper Gummi or Sprinter Gummi Boots at Half Price! 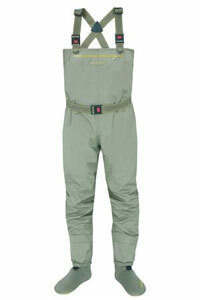 These women's fishing waders are designed specifically to women's fit specifications. The Encounter wader is the new standard for value waders, built from a 4-layer nylon fabric that offers an optimum balance between durability and breathability. The fit has been revamped to match Orvis's award winning Silver Sonic family of waders; designed for women who fish, by women who fish. Over the years, the most common feedback Orvis has received from ladies who fly fish is that they haven't offered any women's chest waders that were truly designed with women in mind. Until now. 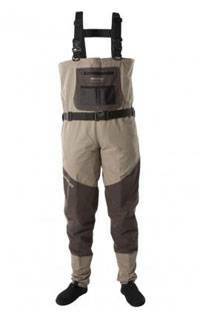 Introducing Orvis' new women's Silver Sonic Convertible-Top Waders. After taking input and suggestions from a large number of fly fishing ladies, they started over from scratch and designed a wader built specifically for women. They tested them on a wide variety of body types, made tweaks and adjustments, and they think the results speak for themselves. Never again will you have to borrow a pair of waders. They have your size. 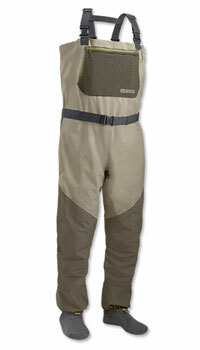 CROSSWATER YOUTH WADERS are designed specfically for the adventurous kid. 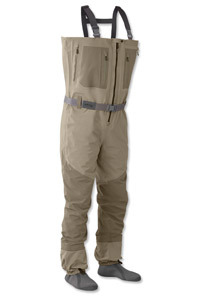 Made from 3-layer, waterproof/breathable DWR coated fabric, its the ideal wader for the upcoming fly fisher. Please Note: This item is special order and can take 4-6 weeks to arrive.  Pre-bent knees for comfortable fit.  Breathable stay cool in summer and warm in winter.  Neoprene socks offer durability and warmth.  Abrasion resistant gravel guards with elastic strap. The Sonic-Pro HD features field tested SonicWeld seams and highly durable 4 layer waterproof - breathable construction with tough, ergonomic neoprene booties to create our most durable wader ever. Ample pockets create enough storage space for essential gear, and our ActiveFit means these waders will be comfortable for even the longest days in tough-wading waters. ** Please note outer pockets are not fully waterproof. Items such as phone that cannot get wet are best stored inside the wader - with additional protection to be totally safe. 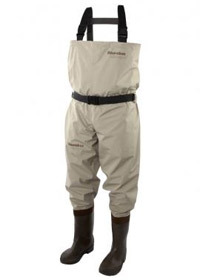 The Redington Sonic-Pro HDZ Zip Front Breathable Chest Wader features field tested SonicWeld seams and highly durable 4 layer waterproof - breathable construction with tough, ergonomic neoprene booties to create our most durable wader ever. Ample pockets create enough storage space for essential gear, and our ActiveFit means these waders will be comfortable for even the longest days in tough-wading waters. The all-new Sonic-Pro wader uses 4-layer waterproof - breathable fabric and SonicWeld seams to create a simple wader with superior durability for uncompromising performance on the water. We designed this wader with minimal pockets and a clean silhouette to provide anglers a durable wader that simply performs in all conditions, from deep wading for spring salmon to hot summer trout runs. 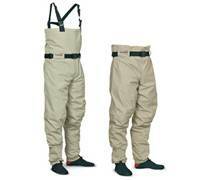  Slim wading belt compatible with majority of pliers and staffs.  100% nylon, 4-layer fabric.  Upper: 185 g/m2 High Density Mini Oxford.  High-tech Ultra Sonic Welded construction (no sew) and double taped seams throughout.  Full center-front RiRi 'Storm' Waterproof Zipper provides easy in-and-out. The Willow River Wader offers women the comfort, fit and durability every fisherwomen craves with feminine details and careful design just for them.  Three water resistant front pockets with YKK®s AquaGuard zippers. Please note some sizes are a special order item and can take 4-6 weeks to arrive. Contact us prior to ordering to check available sizes. 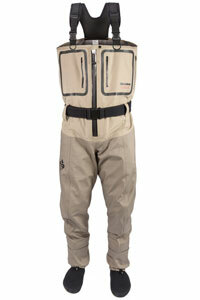 The Keeper wader by Vision is built using the experience of over a decade spent making breathable waders. A proven design, built with a durable yet light 4 layer fabric, taped neoprene "foot shaped" booties, Built-in gravel guards with elastic fitting around boot collar. They are easily folded down and worn at waist height. There's an internal mesh pocket with zipper closure and Keeper waders are still supplied as standard with an adjustable belt.